As interest rates continues to drop we are seeing a flood of available cheap debt. This paper explores if investing in equity using ambitious gearing can be a worth while endeavor in order to take advantage of the available liquidity. Between start of January 2010 and end of June 2016 the Oslo Stock Exchange Benchmark Index (OSEBX) has increased by 58.6%, at an annualized rate of return of 7.4%. At the same time we’re seeing gearing opportunities with as low as 2% interest rate. Does the cheap debt offset the risk of gearing up? Warning: The following analysis is only provided as an academic analysis, and should not be construed as financial advice in any way. As always, past performance does not guarantee future results. This paper concludes that there is indeed increased profitability from low interest rates, and that lower interest rates improve risk adjusted returns (Sharpe Ratio). However, even at 1% interest rate it does not beat the risk adjusted return of the non-gearing scenario. It makes intuitive sense that lower interest rates make geared investment’s risk adjusted return approach but not exceed the non-geared investment’s risk adjusted return. It implies that gearing simply increases return at the expense of risk, while you incur a liquidity cost (interest) which makes it less preferable from a risk neutral perspective. As part of this analysis an R script was developed. In addition to the underlying instrument price history, the script takes the following inputs: Annualized interest rate, monthly allowance, gearing factor, sampling period, investment period, confidence level, and simulation count. It then simulates market conditions using bootstrapping in order to output prediction bands (i.e., intervals) and a probability of margin call. The simulation period and the sampling period are decoupled. Meaning the period we draw simulated returns from doesn’t have to be the same period we run the simulation on. Interest costs are accrued at the end of the month, while allowances are released at the beginning of the month and immediately invested with gearing. 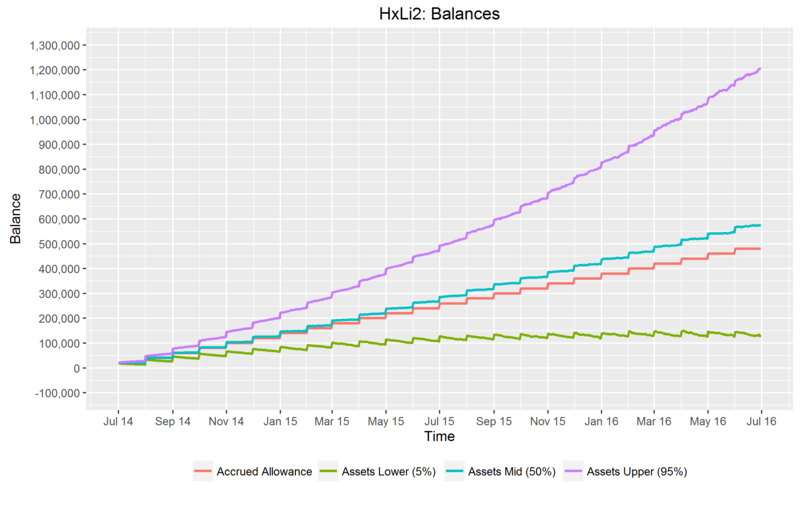 The primary study case is the HxLi (i.e., High Gearing, Low Interest Rate) scenario, where we have a gearing factor of 2.0x and an annual interest rate of 2.0%. 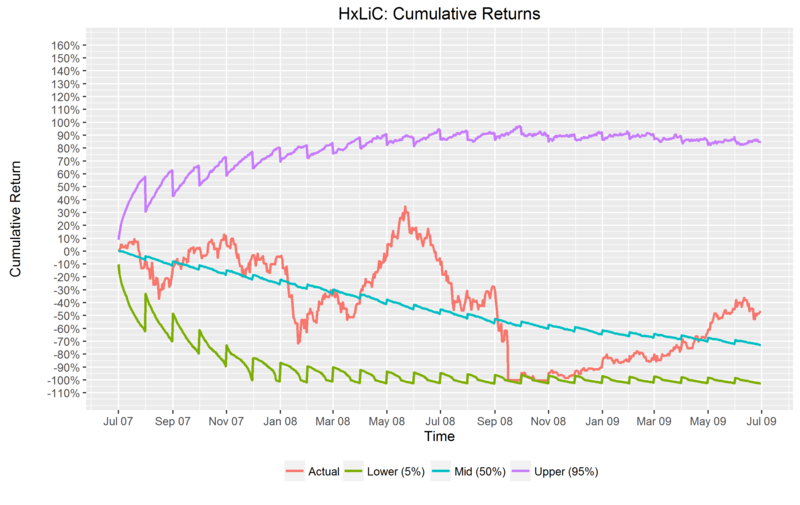 In addition to these scenarios we’ll look at a special stress test case, lets call it the HxLiC scenario, where we both sample and simulate on data from the Financial Crisis of 2007–09 using the standard HxLi scenario. We’re measuring this period over two years, from July 2007 to June 2009. 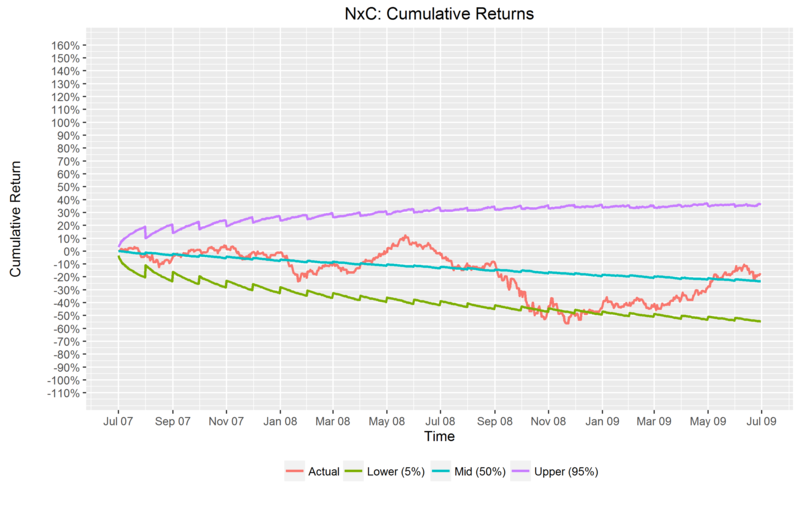 For comparison, let’s also include a scenario NxC where we don’t gear during the Financial Crisis. After imputation of missing values the the price dataset used for sampling daily returns has 6026 observations. Imputation (e.g., filling inn blank data) is done by using the previous days prices. Margin Call is determined if the loaned amount exceeded the current asset balance. In order to account for margin call during a particular day, the low price of a day is used to determine the asset balance. That said, the close price is used to calculate the rate of return if margin call isn’t done on a particular day. At a margin call event all assets are liquidated and loans repayed to the fulles extent. Investments resume the next month when a new allowance is issued. Gearing also continues if the scenario warrants it. First lets look at how accumulation of allowances (investments) look without gearing and with high gearing (2x). Use the slider to compare the left (no gearing) and right (2x gearing) graph. What we are looking at here is the increase in assets over time. 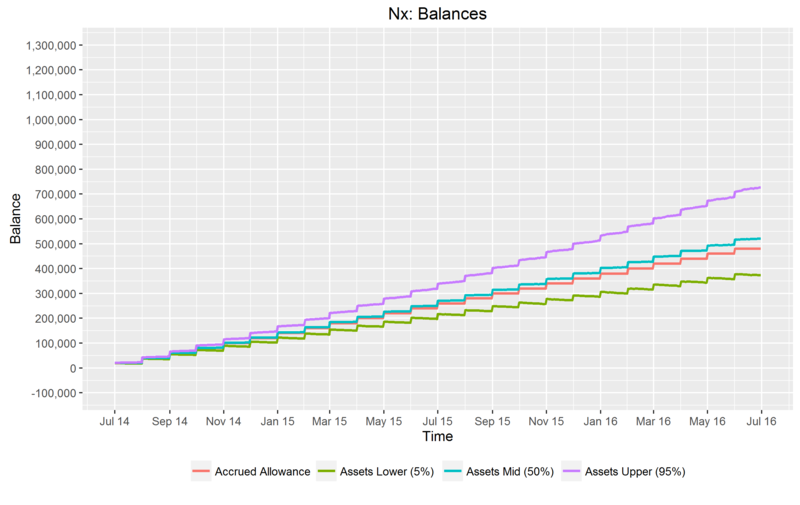 The red line is the original allowance of NOK 20 000 given each month in aggregate. 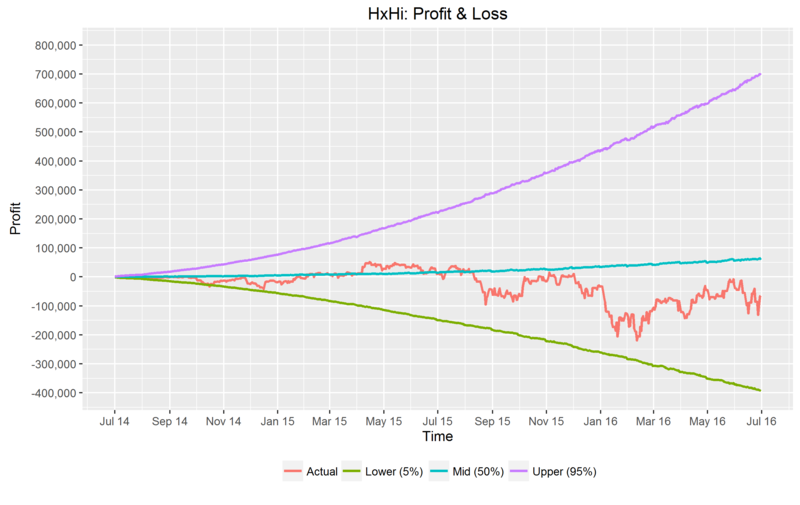 Performance above this line produce profits. The expected (i.e., median) line is teal colored and marked as “Asset Mid (50%)”. We expect the assets to fall 50% of the time above and under this line. Between the remaining upper and lower lines encloses an area we can expect the assets to fall within 90% of the time. 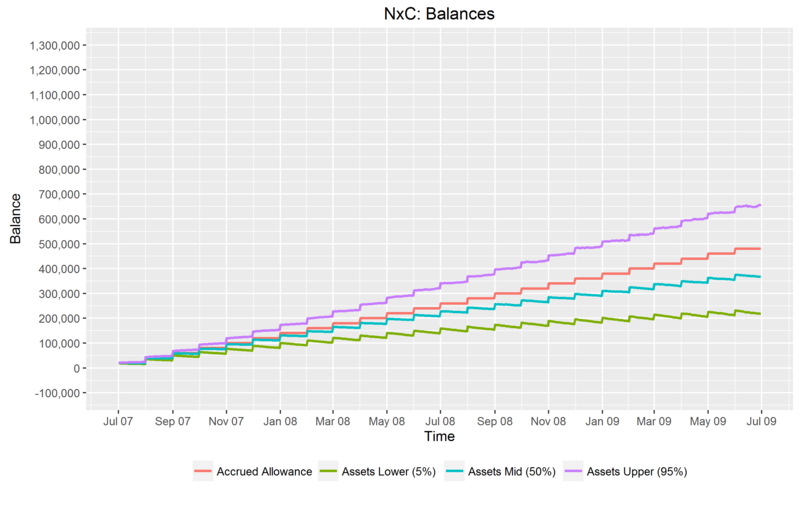 This means that 5% of the time the asset level will go above the upper line, and 5% of the time it will fall below the lower line. Thus we are looking at a 90% prediction band (i.e., series of intervals) generated from the 10 000 simulations. Sometimes people mistakenly call these confidence intervals or bands, but that’s something related but different. It is clear that we see a enormousness change in possible outcomes when we gear up. Because the balance itself might occlude the performance lets look at the same scenarios, but only looking at profits. Notice that we’ve changed the red line to mean the actual performance during the selected period. It shows what you would actually have gotten in profit if you traveled back in time and applied the strategy on real data. During the two year period we have invested NOK 480 000. If we do not gear up we see (from the tables in the appendix and the graph above) that the 5% Value at Risk (VaR) downside is NOK 106849. This means we expect our losses to never exceed NOK 106849 more often than 5% of the time. If we gear up 2x then things change dramatically. The 5% VaR then produces a NOK 355 164 possible downside. That said our upside also changes from an expected profit of NOK 39970 without gearing to a profit of NOK 102411 with 2x gearing. In absolute terms these numbers might be hard to interpret, so lets look at them from a percentage point of view. Here we see that 2x gearing gives a 5% VaR downside of -73.99% (-49% annualized) and expected return of 21.34% (10.15% annualized). 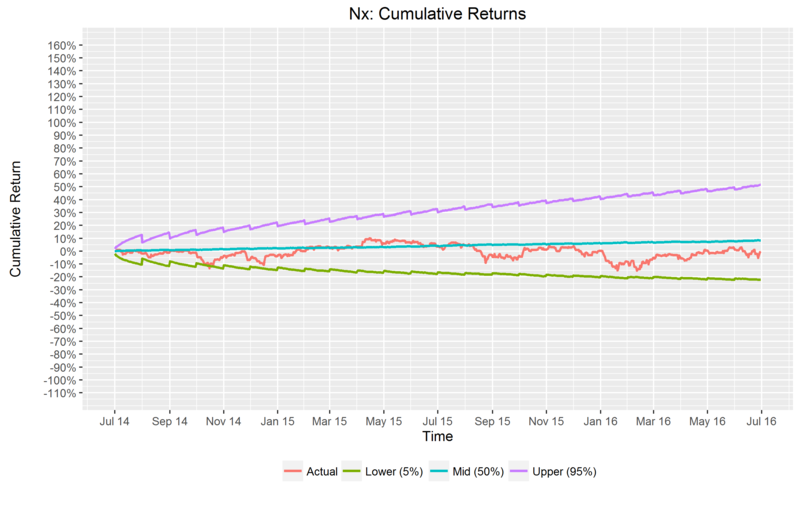 No gearing gives a 5% VaR downside of -22.26% (-11.83% annualized) and an expected return of 8.33% (4.08% annualized). This looks like dire odds, but keep in mind the 5% upside. You are just as likely to get a 154.15% (59.42% annualized) upside as the -73.99% (-49% annualized) downside. Finally we should mention the probability of getting a margin call during the period. Without gearing it’s naturally a likelihood of 0% to get a margin call, but with 2x gearing this spikes to 5.87%. If you have a gearing of 0.5x this falls down to about 0% again. Now that we’ve looked at how gearing affects the investment we should explore what impact a higher interest rate has on gearing. The analysis from the previous section used a low interest rate of 2%, here we will pump it up to 6%. Let’s look closer at the alternatives in terms of risk adjusted return. The following table shows the Sharpe ratio over the two year period. The annual risk free asset is set to about 0.5% or about 1.0% biannually. This is inspired by the current 3 year Norwegian government bond. 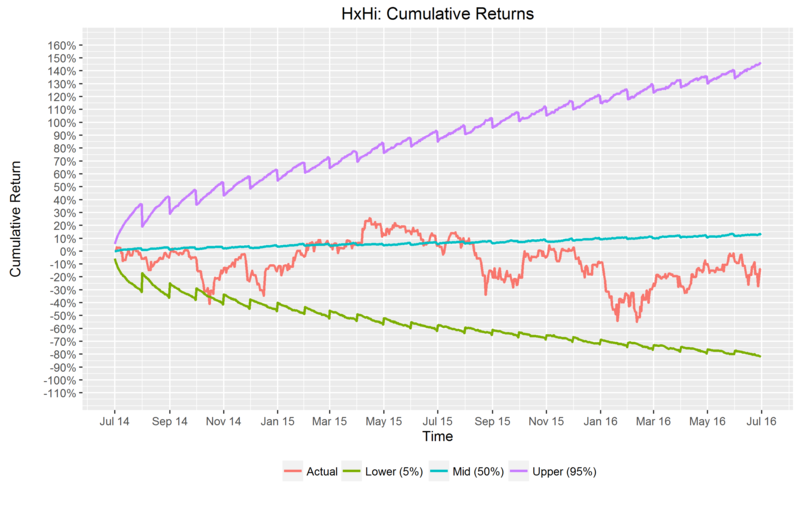 Here we see that the risk adjusted return for the non-gearing scenario is preferred. However, we should notice that a low interest rate definitely makes gearing more attractive. When we go from the HxHi scenario (6% interest rate) to the HxLi scenario (2% interest rate) the risk adjusted return gos from 0.17 to 0.29, not far from the non-gearing (Nx) scenario of 0.32. 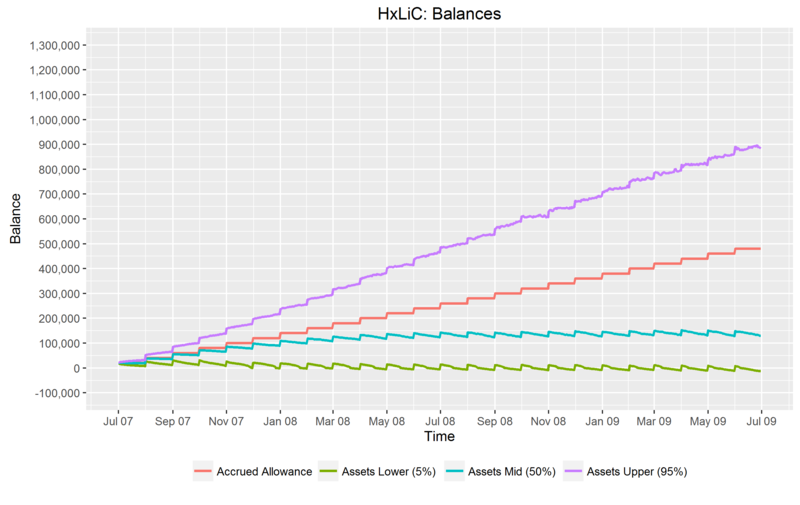 Because this is so close, we’ll add a last scenario HxTi: High gearing (2x) and a tiny interest rate of 1%. 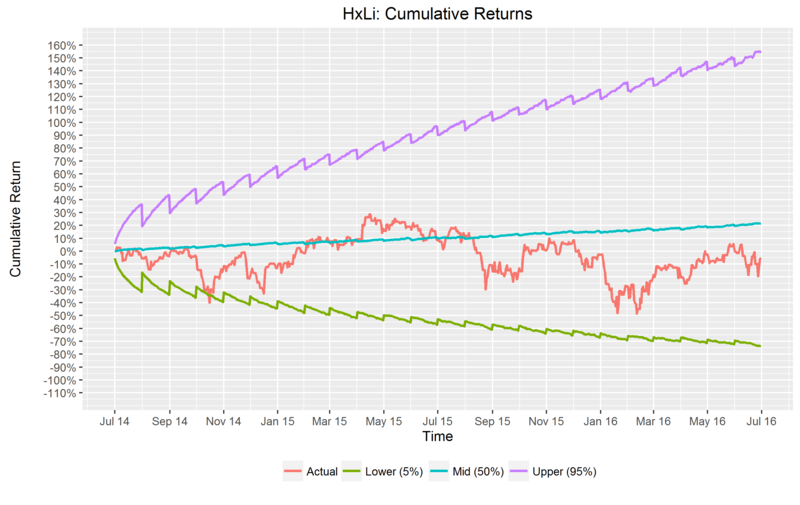 The HxTi scenario produced a expected return of 22.69% and standard deviation of 69.46% thus the risk adjusted return is 0.312 just under the non-gearing scenario (Nx). Thus in general it does not seem that gearing is preferable given a risk neutral outlook. Now that we’ve explored how gearing and interest rate affects our investment, let’s do some stress tests. The previous analysis was done through sampling of data throughout the last 16.5 years. This means our simulations reflect a typical year. What if we did our gearing during the financial crisis? The following stress test uses data from only during the financial crisis. Let first look at the difference between the two sampling periods. The following compares a typical year versus a financial crisis year – both without gearing. It’s safe to say that this period of time was disastrous, even without gearing. What if we were 2x geared? On the left you see the typical development with 2x gearing, while the right shows 2x gearing during the financial crisis. The red line shows actual development during the time, if you had employed the gearing strategy. Notice that real data actually wipes you out with a margin call. It might be reasonable to look closer at the margin call probabilities later. In any case, the 5% VaR is a whopping -102.73% for the two years. It’s actually not mathematically possible to calculate an annualized version. But you can see it lies at 100% loss from the 6th month on. You actually owe money after getting wiped out. This is due to the margin being call at the worst price of the day. Let look at the asset balance to get it more tangible. This doesn’t look good. Expected losses for the two years is NOK 350812 during the financial crisis, as opposed to an expected profit of NOK 102411 during normal times. 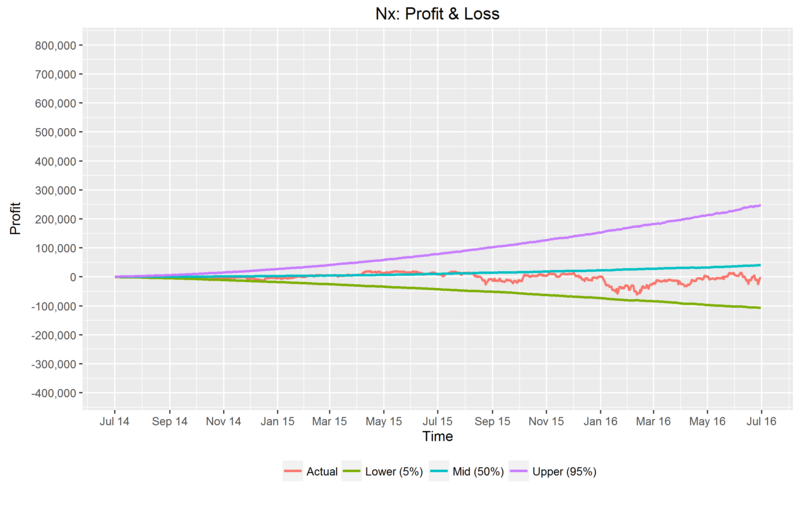 In relative terms this is an expected loss of -73.09% (48.13% annualized) versus an expected profit of 21.34% (10.15% annualized), respectively. The likelihood of getting a margin call during the simulated scenarios is generally pretty low, close to zero, except for when you’re highly geared or during a recession. 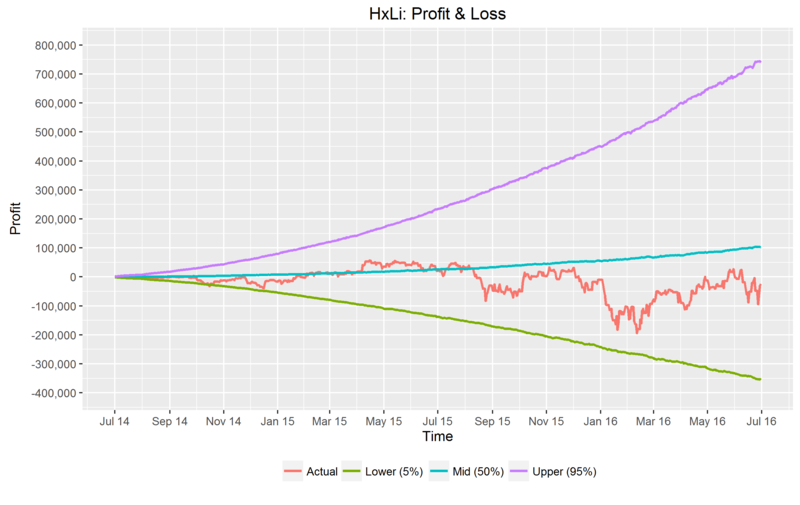 The probability of margin call is 5.87% during the HxLi scenario where we have high gearing (2x) and low interest rate (2%). 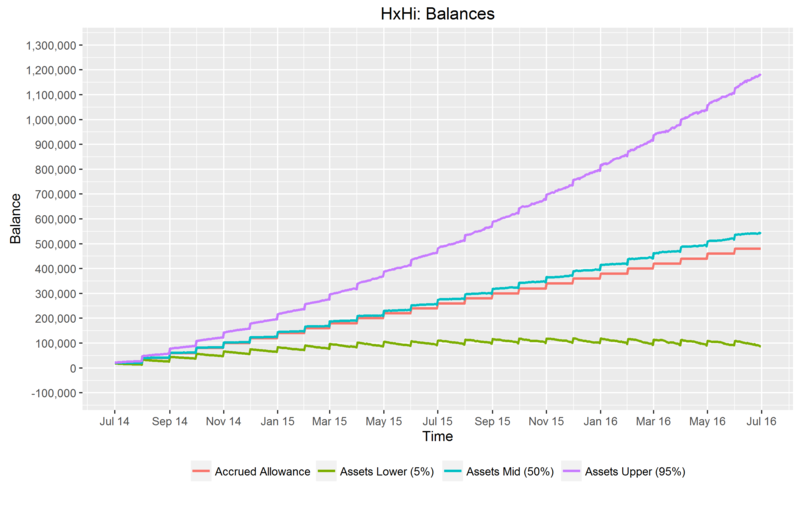 It goes up to 8.40% for the HxHi scenario where we have a higher interest rate (6%). During the financial crisis with 2x gearing the probability of margin call is 78.87%. In practice you might even get multiple margin calls if you continue to gear 2x after being wiped out. These numbers aren’t annualized, and can’t be easily annualized without changing the code. Thus future work includes measuring probability of margin call for particular periods of the simulation, say every year. The author and copyright holder of the following source code is André Christoffer Andersen. The source code is provided under the following Creative Commons license: Attribution-NonCommercial-ShareAlike 4.0 International. Please contact the author for commercial use. #365 days becuase we are including all days of the year in the ror_mean and ror_sd calculations.